Ian MacGregor, chairman and president of North West Refining Inc. (NW Refining). For some people, retirement is a time to slow down and tinker with a hobby or two. You know, restore that classic car, write a novella, or take up knitting. Not so for Ian MacGregor. With that thought, MacGregor went full steam ahead into NW Refining, and into the one project that has the ability to completely redefine and maximize everything Alberta has to offer. It is the North West Redwater Partnership’s creation of the Sturgeon Refinery. To first understand the incredible impact this refinery is poised to have in, and beyond, the province, one must first understand the man who casually decided to change the world. Ian MacGregor was born in Alberta and was the first person in his family to go to university. “I took mechanical engineering,” he says dryly. “It was because I was good at fixing cars, and that’s what my mom though mechanical engineers did!” Oops. Well, it suited him anyway. MacGregor is a builder and tinkerer and he’s always creating something. During grad school, he came across some guys in the office that were looking to build a little machine – so he built it for them. Then he quit grad school and just kept building machines. Apart from one summer job, he always supported himself through the work he did with his own hands. He also has a fascination with ironworks. “Dad was in charge of selling scrap iron in his shop, so the owners of our local junk yards were trying to make friends with him. They let me take home whatever I wanted – a distributor, a speedometer – anything. I’d take it home and tinker with it, then get something else. As I got older, I picked up cooler stuff.” His “stuff” that he has collected over 30+ years is now one of the largest collections of early technology, including tools and machines from antiquity through the early years of Canadian history. It is all housed in a 20,000 square foot private museum. When he’s not collecting, tinkering with, and building machines, he rides his bike and spars weekly with a retired boxing professional – you know, as most retirees do—and when he’s not in the museum or biking to the boxing ring, he’s a little busy with the first $9.5 billion dollar phase of a bitumen refining plant that will be the first of its kind in the world to incorporate carbon dioxide (CO2) capture and storage as part of its design. While many Albertans know that a large refinery is in the works in Alberta’s Industrial Heartland, and that it means jobs for the recently recessed province, the scope of what is actually going on, and its implications, are massive. “What we make in Alberta is bitumen,” MacGregor explains. “It’s the lowest quality, lowest level of oil. We ship it away and it’s refined and made into diesel, then shipped again somewhere else. Because bitumen is really thick, we have to add hydrogen. This also adds a lot of CO2, and it’s problematic if you don’t do something with it. The thick bitumen is also difficult to get through pipelines, so it’s very difficult to ship. To ship one barrel, you have to add half a barrel’s worth of diluent – and we are short of diluent in Alberta. The province is actually shipping two barrels to get the equivalent of one barrel to market. “Let’s redefine! Let’s do things properly and deal with the issues! He’s not stopping there. Remember that pesky CO2? When the refinery captures the CO2, the product goes from having the highest intensity of that gas to the lowest. Enhance Energy Inc. is running the Alberta Carbon Trunk Line (ACTL), which is currently the largest carbon capture and storage project in the world. ACTL is built to handle 10-fold the capacity of the CO2 the Sturgeon Refinery can produce, which MacGregor says is like “taking every car in Alberta off the road” in terms in reducing by-product pollution. “I’m trying to create a ton of jobs,” he says earnestly. “We need these jobs. These are jobs that are technical, highly-skilled, and beneficial for the environment. We are making lots of margin in Alberta to pay for things like hospitals and schools. That’s what I can do to make the world a better place. “But we can’t fall asleep. We have to get moving on this. I’m frustrated because we have to move faster. Alberta has been good for so long that we are all living in a dream world. We need to use the tools we have for the future and use them intelligently. You can hear and see the future right now. The Sturgeon Refinery is powering up, one machine at a time. The Sturgeon Refinery is MacGregor’s biggest machine, one he spent a lifetime preparing for. The hunter is leading a team into the forest. Is he leading them blindly? Certainly, he maintains his busy life by carefully sticking to a regime designed to maximize work/life balance… right? Not so much. MacGregor is determined to help as many Albertans as he can to have the type of fun he loves, and that’s why he and Canadian Natural are both huge supporters of Women Building Futures. MacGregor is unstoppable in his desire to turn Alberta around, show the province how to fully take advantage of its natural resources, and inspire as many people as possible to do the work they love. Does MacGregor pause to look back over his life and all that he has accomplished – and is poised to accomplish? Did he think that one day he would be spearheading a project worth billions in dollar value, and even more in future economic value? One that would revolutionize the province and turn our greatest resources into something even more stable and sustainable? Does he think of the impact he would have on the environment by changing the way we ship oil and by capturing and using up CO2? Does he solemnly raise a glass and give a slight nod to the graduates of Women Building Futures as they march their skills into the workforce? Of course not. He doesn’t slow down long enough to reflect. It’s not a bad philosophy, and one that has certainly worked for him thus far. 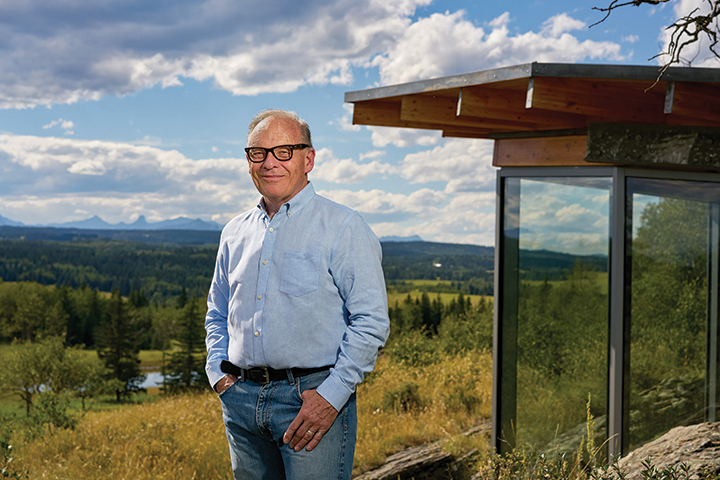 So what comes next for the man who is determined to change Alberta, and the world? We’ll stay tuned, MacGregor. We’ll stay tuned.